^ Johnson, K. M.; Webb, P. A.; Lange, J. V.; Murphy, F. A. (1977). “Isolation and partial characterisation of a new virus causing haemorrhagic fever in Zambia”. Lancet 309 (8011): 569–71. PMID 65661. ^ "400,000 rapes in Congo in one year". The Independent. May 12, 2011. ^ ﻿UN urges long-term commitment to today's peace deal on DR Congo﻿ (Report). United Nations News Centre. (February 24, 2013). http://www.un.org/apps/news/story.asp?NewsID=44211#.UU0HYhcbKSo. ^ Rowe, Peter G.; Kuan, Seng (2004). Architectural Encounters with Essence and Form in Modern China. MIT Press. p. 229. ISBN 026268151X. https://books.google.com/books?id=9irZf11s4NkC&pg=PA229&lpg=PA229. ^ Oliver, Guy (2006). Almanack of World Football 2007:The definitive guide featuring all the facts and figures from the FIFA World Cup. Headline Book Publishing. p. 59. ISBN 0755315065. https://books.google.com/?id=x5na1WdCYywC&q=Martyrs%27+Stadium. ^ a b "Zaire (Democratic Republic of Congo)", Adherents.com - Religion by Location. 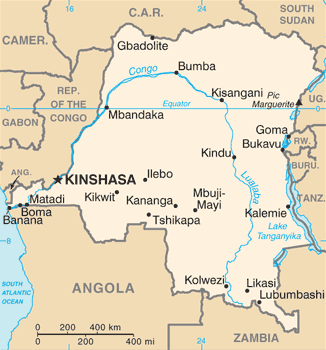 Sources quoted are CIA Factbook (1998), 'official government web site' of Democratic Republic of Congo. Retrieved 25 may 2007. 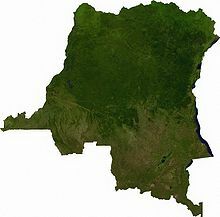 ^ a b c d e f "Congo, Democratic Republic of the". 2005 Findings on the Worst Forms of Child Labor. Bureau of International Labor Affairs, U.S. Department of Labor (2006). This article incorporates text from this source, which is in the public domain.